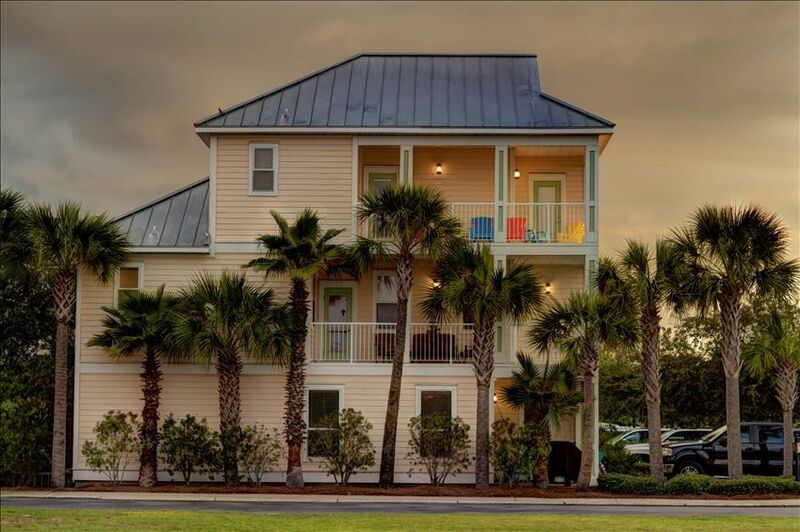 Feel the restfulness of the tropics while looking out over our 10 palms from either of the 2 wraparound porches. flatscreen TVs, full service kitchen, washer dryer in separate laundry rm., 4 full bathrooms (including jaccuzzi tub in master suite), well appointed bedrms; king size in Master, 4 queen size beds, bunk bed and a full size futon in game room. All the amenities to make you feel at home on vacation. Trolley service to beach, walk-in lagoon style pool, with multiple waterfalls. Close to beach, mall and great restaurants. No more then 3 cars are able to fit in drive way. There is additional parking located across from the house, but it is a first-come first-serverd basis. (7) There are flats screens in every bedroom. Well maintained property. Can’t wait to come back. This is a killer house. Perfect for family’s. Unhappy with outdated unit furniture covered with slip cover that needed to be cleaned. No hangers in the entire 6 bedrooms, additional pillows provided but no pillow cases, unsafe bunk bed reported to management who replied multiple times that they would come and tighten screws. We addressed these concerns before we signed the contract as there was a review that say the unit was not cleaned and we were assured they changed cleaning services and the issue had been resolved. The owner of the cleaning crew was suppose to come and never showed up. TVs do not get very many stations and internet is spotty on 3rd floor. I will say the location was fabulous as well as the pool. Let me start my saying we use HomeAway for vacation rentals 1-2 times a year. We have a large extended family and we like to get together every summer. This home seemed to fit the bill nicely. All in all we had a nice time with the family but I would not stay in this house or visit Destin again. 1- kitchen has two refrigerators which was nice. 3- Shuttle to the beach was there immediately when we needed them. 1-The biggest issue we had was with the bunk bed on the second floor. It was a metal bunk bed and was not screwed together properly. The screws were all starting to come out and it was very rickety. So much so that we would not let any children sleep on the top bed for fear it would fall. The bottom bed was so noisy every time someone rolled over the entire top bunk rattled back-and-forth. I sent numerous messages to the management company but they never wound up sending anyone over. They kept saying they were going to talk to the cleaning ladies or someone to fix it but it never got fixed. We had to put one of the kids in our bed and luckily had an inflatable the other child for the entire week. 2- The couches in the living room are horrible. They are old and very uncomfortable. They are simply covered with a descent looking couch cover. The cover always comes off and the back pillows are so old and squished down it was difficult to sit on. 3- the keypad to enter the neighborhood shocks you every time you touch it. On a sidenote...and this has nothing to do with how we scored this home but I felt like I had to mention it. We had never vacationed in Destin before so we did not know what to expect. Destin is over commercialized and over populated with tourists and vacationers (HEAVY TRAFFIC) for the summer. Every place you go to is overcrowded and overpriced. We went to Walmart to do our grocery run when we first arrived and I have never in my life seen a Walmart so busy and crazy. It was like a hurricane was coming. When I spoke to some of the employees there they said it was like this every week because people were checking in for their vacation. I realize that they are all doing exactly what I’m doing. On the side of the road there all these little tourist trap Type stores. When I entered the neighborhood where the home is located I noticed rental signs in 98% of the homes. This atmosphere want really my thing And I wished I had known before coming so I thought I would mention it.